Heat oven to 350°F. Grease 13x9x2-inch baking pan and set aside. In a large bowl, whisk together cocoa and baking soda. Add half of the melted butter and boiling water; whisk together until mixture thickens. Stir in sugar, eggs, remaining melted butter, vanilla extract and salt; whisk until smooth. Add flour and chocolate chips, stirring in to blend completely. Transfer batter into the prepared pan and bake in the preheated oven for 35-40 minutes or until brownies begin to pull away from the sides of the pan. Remove from oven and cool completely on a wire cooling rack before frosting. In the bowl of a stand mixer fitted with a paddle attachment, beat butter and vanilla extract until fluffy. Add powdered sugar and cocoa alternately with heavy cream, and continue to beat until you get a nice spreading consistency. 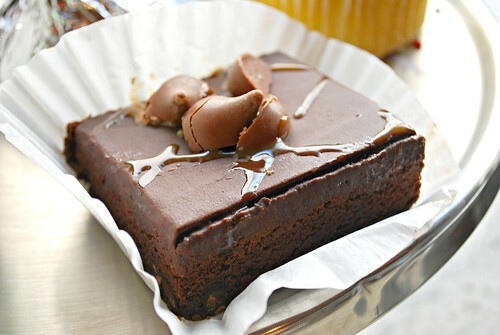 Drizzle caramel sauce over the frosted brownies and scatter halved caramel kisses over the top to garnish. *Gluten free flour blend: This is the best combination for my personal uses and has never failed me. I purchased a majority of the ingredients at an Asian market (at less than $.99/lb) and the other ingredients marked were Bob Red Mill brand. Cornstarch was Argo brand. 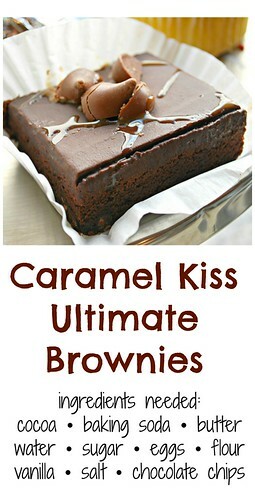 These brownies look so decadent! I have to tackle these some day soon. It's nice that you're at least able to have a bitter sweet ending. Not uncomfortable for either you or your current firm. On my list to bake. Sounds fabulous! thank you for the recipe, I have just ventured into baking the past 2 weeks and this is a good start for practice especially because I love caramel! That is one pretty Brownie. This would be great warm with some icecream!